The genesis of Napa at Last Light, the final volume of a trilogy, began with Napa: The Story of an America Eden (1990), “a journalistic foray to California in the early 1980s.” What appeared to be sunshine and flowers was revealed to be the dark clouds formed by avaricious multinational companies, shattered dreams, and insatiable efforts to squeeze every drop of profit from the land. Big business interests were in conflict with the traditional agricultural natives. 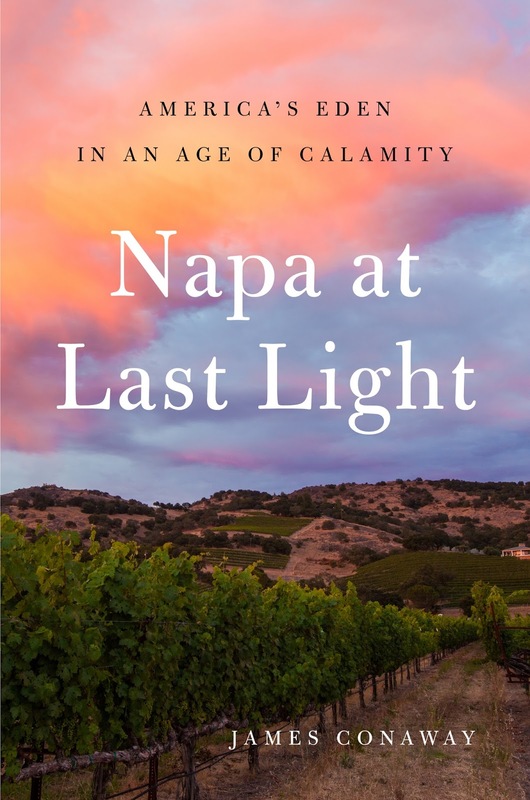 The community of Napa Valley, a beautiful place where people knew one another and many were related, evolved into a money-grubbing, backstabbing society and the dissolution of so many ties. In Conaway’s view, the problem is simple. Napa is beautiful and the land produces fine wines so more people and money come. Trees are cut from the hills and vines are planted. Then it rains and the hills slide away, or a drought occurs and human-caused fires consume whatever vegetation exists. When the trees and natural vegetation disappear, water runs away and does not soak into the ground. The aquifers go unfilled or empty. Who then claims that reduced amount of water: people or the winemakers? The problems could be avoided, but the valley is beautiful and it produces good wines so the corporate owners resist efforts to support environmental regulations that could protect the land and the livelihoods of thousands. 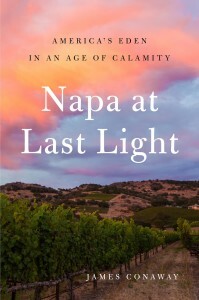 Conaway is not hopeful that the competing camps of developers and corporate winemakers will resolve their issues. After the great fires of 2017 that caused considerable destruction (but less than we might have perceived through televised reports) the status quo remained. The developers called for clearing more land and planting more vines because “vineyards make good firebreaks. They also mean more water loss, more people, and more activities unrelated to agriculture – houses, roads, service buildings, power lines.” But, in a bit of guarded optimism, Conaway notes that the “county officials seemed increasingly uncomfortable with controversial projects.” Perhaps the light at the end of the tunnel is not an onrushing train.